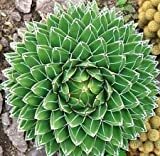 Agave Victoriae-reginae for sale – Easy plant to grow, plant the grown for the ornamental leaves, planting in spring to autumn better to buy plant but another option to start from seeds yet more challenging. Growing information: perennial plant, growing hardiness zone: 7-11, water needed – small amount, light conditions – partial to full sun, height: 20-50cm 8-20 inches. 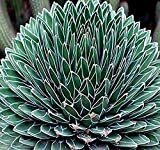 Agave Victoriae-reginae for sale – When is the best season to buy Agave victoriae reginae? 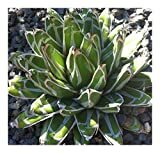 What need to know before buying Agave victoriae reginae? Before buying Agave Victoriae-reginae need to know that Agave Victoriae-reginae it’s slowly grow plant, need little amount of water, full to half sun, leaves can green and in variegata can be: green with yellow or green with white it has flower bloom after several years, blooming once in a life time and after die, mostly there are daughter plants that grow vegetative.